I’m going to start by saying that I don’t think everyone needs to have a meal plan, but I think it also depends on what you’re goals are and what fits your life. 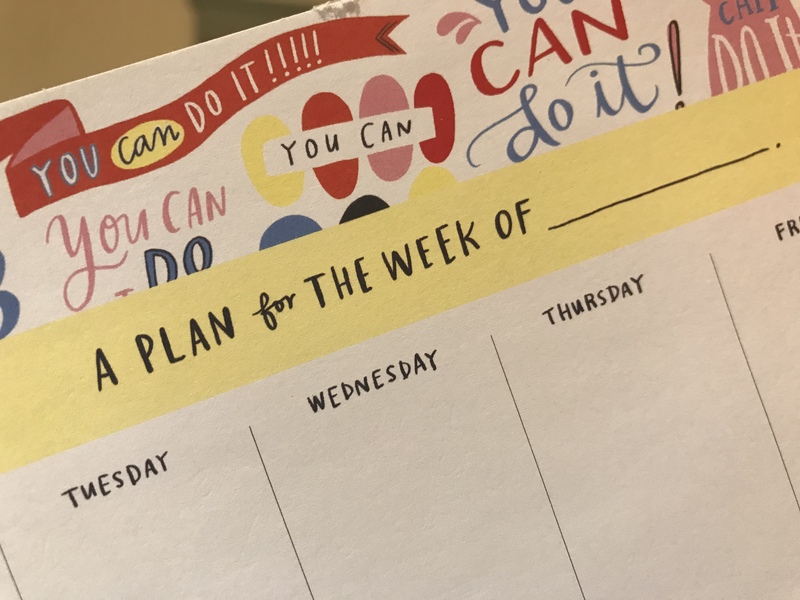 If you’re busy, having a loose plan can help you save time, which can decrease stress and help ensure that you are eating actual meals and not just grazing while looking for the next thing to cook up. For weight loss/fat loss purposes, meal planning can help you moderate your calories, which is also something to be mindful of if you’re trying to maintain as well. For all situations, planning can help you stay on budget – and that’s just not something we talk enough about when we discuss health. As a health coach, I work with clients to create their own meals plans that work with their lifestyles and goals. In the state of Massachusetts, only a registered dietician can provide specific meal plans. Other states have different regulations, but since I live and work in Massachusetts and online coach crosses state lines, this is the framework I work in. I also don’t believe a meal plan teaches anyone, it just reinforces food rules. That said there are some special populations that do need some rules – and they know who they are. What are your physique goals? What are your activity goals? Do you have strength or endurance goals? How much time do you want to spend cooking or planning? Do you even like cooking or planning – if not, how do we make it more fun or easier? What do you like to eat and why? What do you dislike and why? These questions give us a jumping point. I work hard to get to know my clients lives including their families, their health isn’t just about them. I also don’t want them to have to make multiple meals just to satisfy their goals. We can make slight modifications so that they’re not making separate meals or even better, we can look at how health can impact the whole family and they can just make one meal. Knowing what a client likes and dislikes helps me make better suggestions for recipes or ingredients. I always say – if you don’t like kale, don’t eat kale. It also encourages the client to think about why they don’t or do like something. Food aversion is a real thing, and it can be navigated, but it really should be considered and explored further by a mental health professional if it is related to other aspects of their history. With a lot of diets, approaches, styles – whatever we want to call them out there, I know there’s a lot of hesitancy in the room. You can cut it with knife and probably spread it on bread. Depending on your history with dieting it’s possible that there are some nutrients (fats or carbs) that you may struggle to see as helpful and that may result in a tough time planning them into your day. I’ve also had clients (and myself included) acknowledge that protein can be a hard nutrient to incorporate at a healthy amount too. Step 1: plan your meals around your specific timing needs. Do you enjoy dinner and having an after dinner TV snack? Plan that first and then work your way backwards. Do you live for breakfast? Plan that and go forward. Do you have a really awkward schedule that keeps you up later at night? Maybe like the dinner suggestion, you plan backwards and shift meals forward, not necessarily utilizing intermittent fasting, but just making a slight shift in timing. Do you or your kids have activities – dance, soccer, CrossFit? Plan around that. You’ll probably need something pre- or post- or both to snack on while you get the next meal. Step 2: consider nutrients or food groups you struggle to incorporate. Plan those first. I can struggle with protein, so I try to plan at least three servings of 4 to 6 ounces. On average an egg white is about 5g of protein and using chicken as another animal protein example 4 ounces is about 25g of protein in its raw form. Because of my activity levels this is a helpful way for me to estimate so I reach my protein needs. Step 3: fill in based on your other nutrient goals. Do you want to be incorporating a certain amount of green vegetables versus starch vegetables? What about fruit? Do you feel better with fat consumption at different times of the day? Step 4: make changes as you need to, but follow the same principles you did when you created your plan. I know it’s a reach to say anyone can follow directions because I do think some people can’t or refuse to or make excuses, but following a dictated a plan doesn’t show what you’ve learned about nutrition or how it impacts your body. I also don’t believe eating the same things every day gives you a chance to trust yourself or implement knowledge in how food plays a role in your day-to-day. 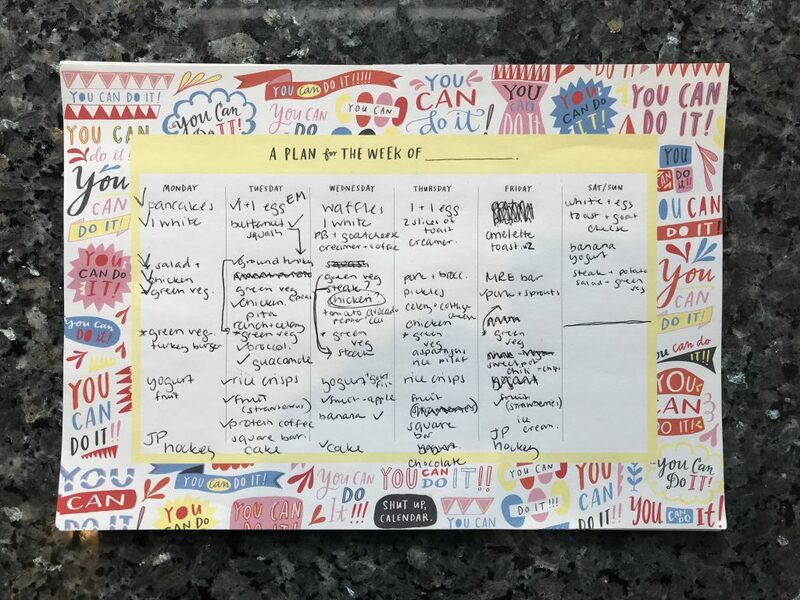 I think creating a plan is helpful, it’s a first step of taking control – but being capable and confident of making similar changes to that plan shows that you trust yourself and you understand how to continue to make healthy choices even when changes are made. 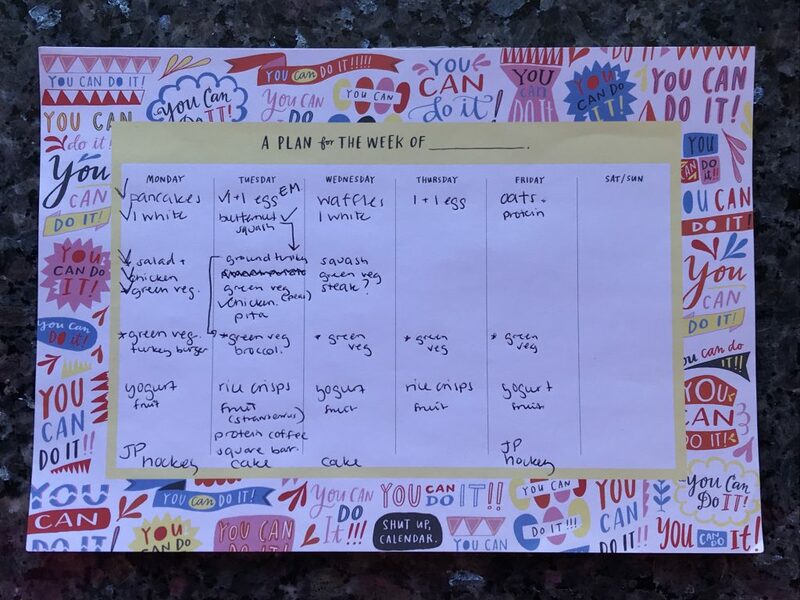 Here are two photos of how my meal plan evolved from the beginning of the week to the end of the week (Last week of March). Every 5 years, the Department of Health and Human Services along with the USDA publish the Dietary Guidelines for Americans. It’s based on the latest research and it’s to help professionals from policy makers to registered dieticians, physicians and yes, me – the health coach help others make healthy choices. This is actually something that I started reading when I started my journey because it’s a good jumping point. I support the idea of the guidelines below, but within those guidelines some of the more specific recommendations are a little broad, but go figure – it’s for a nation. Also, keep in mind that many Americans don’t actually follow these recommendations. Here are the 5 guidelines, and you can check them out more in depth here. Support healthy eating patterns for all (home, school, work and community). Here are the standard recommendations for intake is in cups, not servings now. Below are standards for what’s called U.S. Style Eating Pattern. Vegetables: 2.5 cups (equivalent) per day and it’s broken down further into dark-green, red and orange, legumes, starchy vegetables and other – you can check that out here. Not everyone can eat dairy. Look for other calcium sources, while they may not be as rich in calcium as dairy products they will be helpful and you can also talk to your primary care about supplementation if you think you really need it. Protein needs greatly vary based on activity, age and gender and on face value this recommendation can be misleading. Again, this is helpful for creating a minimum, but consider what your unique life. Not everyone feels great when they eat grains. There is a difference between an allergy and an intolerance as well autoimmune disorder. While grains are an awesome source of vitamins and minerals, you need to find that happy balance for yourself and for many that may mean limiting these. Again, speak with your primary care and see if they can assist you or refer you. More specific recommendations I tend to disagree with are estimated calorie needs. Looking at the caloric recommendations for myself, I know I would gain weight with the sedentary calories if I truly was sedentary because it takes age and gender into consideration, but not height or body size. I truly believe these need to be uniquely determined. Another thing I slightly disagree with is daily macronutrient goals, which can be found here. I disagree with them mostly because of how varied they are. Again, these are great tools for us to start with and give us to opportunities to ask better questions. Make sure that your plan considers all of you.